Accounts of Katharine’s life tend to focus heavily on the last ten years of it – the epic struggle with Henry to prevent the annulment of their marriage – but before that, Katharine had spent sixteen largely happy years with her husband. She was his trusted advisor, served as Regent of England whilst he was in France and raised troops to repel a Scottish invasion. It was the long, unhappy toll of miscarriages and infant deaths that weakened their marriage. The figure of Katharine as a patient Griselda was a stereotype that appealed to a notion of wives as dutiful and obedient, even in adversity, but Katharine would have scorned such a passive depiction. She was a warrior, like her famous mother – fighting her cause with strategic brilliance within the scope of law and church. In the end, Henry could only win by changing the rules of the game. Jane Seymour was Henry VIII’s favourite, but this icy, ruthless woman wouldn’t win the popular vote. Anne Boleyn would take those laurels today. But for contemporaries, Katherine of Aragon was Queen of Hearts. She also gets my vote as the only wife Henry VIII expressed real fear of. Go girl. I’ve always had great admiration for Katherine of Aragon as a woman of high integrity and principle – I even named my daughter for her. She deserves to be celebrated as one of the most courageous and loved queens of England. 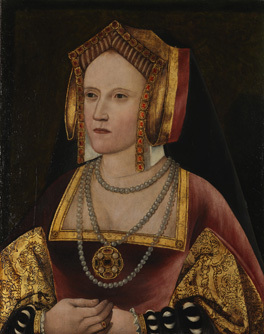 Catherine of Aragon, the beautiful, well-educated daughter of a wealthy warrior queen, swore on oath she was a virgin when she married Henry. She led England as Queen Regent when Henry left to fight the French - and they were married for twenty-four years, making Catherine Henry’s most devoted queen.